We wanted to do this in memory of 2 of our very dear friends who succumbed to cancer and passed on in 2015. The idea then simply became a mission after recruitment of a few other close friends that have the same passions. 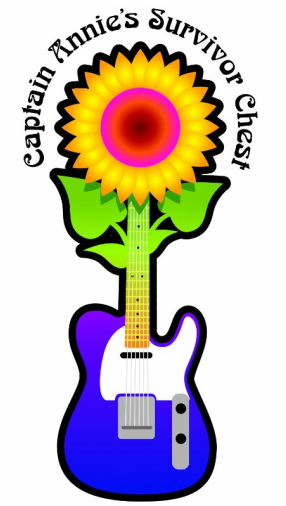 So, in memory of "Capt" Kirk D. LeClere and "Annie" Ann M. Hoerauf, and in support of their loving families, we became "Captain Annie's Survivors Chest (CASC). We sincerely hope we can make a difference in our corner of the world. Helping cancer patients and their families focus on health and well-being by reducing the burden of financial challenges during treatment. Kirk was born December 1, 1959 in Cedar Rapids, Iowa to Dean and Maxine LeClere. His sister, Kristi, was so happy to have a baby brother! He went to Cedar Rapids Linn-Mar High School until after his Junior year when his family moved to Maquoketa, Iowa. There, his parents bought a True Value Hardware Store and became well known in their community. Kirk was very active with athletic teams such as baseball and basketball. He also was a member of the high school choir and band group where he met many of his friends. He went on to be valedictorian of his high school class in 1978. From Maquoketa he went to Luther College in Decorah, Iowa and graduated with an accounting degree in 1982. He went to work for McGladrey in Rockford, IL where he did public accounting. After a few years, he joined Ingersoll in Rockford and was sent to Midland, Michigan to help when Ingersoll merged with CM Systems as their controller. He stayed with them until 1999 when he met Fritz Horak on an airplane and ended up as CFO and Vice President of The F.P.Horak Company in Bay City. Throughout this time, music was a very important part of Kirk’s life. He hooked up with Tim Boychuck in 1993 and they have been the core of many local bands. They started in our basement and ended up playing in many local establishments. The most important part of Kirk’s music life was being involved with The Timothy Hyde Project which included the live performance of HEAL, something he was very proud and honored to be a part of. Kirk played and sang music up until the day he died. It always made him feel calm and relaxed. Kirk fought a hard battle of radiation-induced osteosarcoma with dignity. He gave it his best with the love and support of his family. His battle began on May 20, 2015 and ended December 4, 2015. He never gave up during those 7 months but always stayed positive when others were afraid. He was always the rock of our family and held us together when the worst was happening. We spent many days and weeks on the road to Ann Arbor and Houston and want to help others doing the same. He would be very proud to have his name alongside Annie Hoerauf’s and be a part of giving back to those fighting the cancer battle. I know he would be honored to help others who need it. Ann was born to her loving parents, Robert and Jane St. Onge on August 21, 1957. One of six children, she grew up in Midland, Michigan, graduating from Midland High School in 1975. Ann was a hard worker and valued employee first at the Midland Country Club and later at Plymouth Elementary where she worked for the Midland Public Schools for well over a decade. At Plymouth she spent time in various roles- in the kindergarten classrooms, in the lunchroom, and in the office. The kids adored her and eagerly anticipated the start of the school so they could see Mrs. H’s smiling face. Ann loved working with children, mentoring them, and helping them achieve their personal best. She married Kevin Hoerauf in 1987 and, together, they raised two daughters, Jennifer and Sara. She was also a loving and doting grandmother to two granddaughters, Hannah and Chloe. She was an avid card maker, reader, and loyal friend to many. Her most important role, though, was her role as Mom and Grandma. She loved nothing more than spending time with her family, celebrating holidays together, spoiling her granddaughters, and taking trips to Lake Huron or Lake Michigan together. Annie fought the good fight against renal cell carcinoma for many years. Her first diagnosis began in 1997, initially taking her all the way to Cleveland Clinic for surgery and follow up appointments. After many fortunate years of remission, Annie was dealt another heartbreaking diagnosis – the cancer had returned, this time spreading to her only remaining kidney. This next leg of her journey took her down to University of Michigan Hospital in Ann Arbor. Her adversity and strength did not waiver and she always took the bad news with incredible poise. The drive from Midland to Ann Arbor became a monthly and sometimes weekly occurrence, often times spending weeks at a time in both hotels and the hospital. Trust us – it was not easy to see that much blue and gold on a daily basis when your family bleeds green and white! The care that Annie received at the University of Michigan was nothing short of amazing and allowed her to keep pushing through for many years. It was no wonder that just a few years later, Annie’s youngest daughter would begin her own nursing career there. A new battle began in 2010 as Annie started dialysis due to her kidney failure. Although a scary and trying time, she took great comfort with the nurses and technicians at the DaVita dialysis clinic. The friendships she made through dialysis were truly amazing. It was never a dull moment around there, as Annie was always joking and keeping a smile on both the faces of patients and staff members. Every year, Kevin and Annie would make Christmas presents for each of the dialysis staff members as a thank you for taking such good care of her. They meant so much to her, and the gift was the least she could do. The continued thanks and appreciation is still felt by our family to this day. Annie’s courageous battle ended on June 12, 2015. She was at peace and she was not afraid. She gave it everything she had and we know she would be truly honored to help others fight the good fight as well.